Deep inside the Milky Way, an old and lonely neutron star plows its way through interstellar space. Known as RX J1856.5-3754, it measures only ~ 20 km across. Although it is unusually hot for its age, about 700,000 °C, earlier observations did not reveal any activity at all, contrary to all other neutron stars known so far. In order to better understand this extreme type of object, a detailed study of RX J1856.5-3754 was undertaken by Marten van Kerkwijk (Institute of Astronomy of the University of Utrecht, The Netherlands) and Shri Kulkarni (California Institute of Technology, Pasadena, California, USA). To the astronomers' delight and surprise, images and spectra obtained with the ESO Very Large Telescope (VLT) now show a small nearby cone-shaped ("bowshock") nebula. It shines in the light from hydrogen atoms and is obviously a product of some kind of interaction with this strange star. Neutron stars are among the most extreme objects in the Universe. They are formed when a massive star dies in a "supernova explosion" . During this dramatic event, the core of the star suddenly collapses under its own weight and the outer parts are violently ejected into surrounding space. One of the best known examples is the Crab Nebula in the constellation Taurus (The Bull). It is the gaseous remnant of a star that exploded in the year 1054 and also left behind a pulsar, i.e., a rotating neutron star . A supernova explosion is a very complex event that is still not well understood. Nor is the structure of a neutron star known in any detail. It depends on the extreme properties of matter that has been compressed to incredibly high densities, far beyond the reach of physics experiments on Earth . The ultimate fate of a neutron star is also unclear. From the observed rates of supernova explosions in other galaxies, it appears that several hundred million neutron stars must have formed in our own galaxy, the Milky Way. However, most of these are now invisible, having since long cooled down and become completely inactive while fading out of sight. Some years ago, the X-ray source RX J1856.5-3754 was found by the German ROSAT X-ray satellite observatory. Later observations with the Hubble Space Telescope (c.f. STScI-PR97-32) detected extremely faint optical emission from this source and conclusively proved that it is an isolated neutron star . There is no sign of the associated supernova remnant and it must therefore be at least 100,000 years "old". Most interestingly, and unlike younger isolated neutron stars or neutron stars in binary stellar systems, RX J1856.5-3754 does not show any sign of activity whatsoever, such as variability or pulsations. As a unique member of its class, RX J1856.5-3754 quickly became the centre of great interest among astronomers. It apparently presented the first, very welcome opportunity to perform detailed studies of the structure of a neutron star, without the disturbing influence of ill-understood activity. One particular question arose immediately. The emission of X-rays indicates a very high temperature of RX J1856.5-3754. However, from the moment of their violent birth, neutron stars are thought to lose energy and to cool down continuously. But then, how can an old neutron star like this one be so hot? One possible explanation is that some interstellar material, gas and/or dust grains, is being captured by its strong gravitational field. Such particles would fall freely towards the surface of the neutron star and arrive there with about half the speed of light. Since the kinetic energy of these particles is proportionate to the second power of the velocity, even small amounts of matter would deposit much energy upon impact, thereby heating the neutron star. The new VLT study by van Kerkwijk and Kulkarni of RX J1856.5-3754 was first aimed at taking optical spectra, in order to study its structure. The astronomers hoped to find in its spectrum some "signatures", i.e., emission or absorption lines and/or bands, that might provide information about the physical conditions on its surface. While the chances for this were admittedly rather slim, a detection of such spectral features would be a real break-through in the study of neutron stars. If present in the spectrum, they could for instance be used to measure directly the immense strength of the gravitational field on the surface, expected to be about 10 12 times stronger than that on the surface of the Earth. Moreover, it might be possible to determine the gravitational redshift, a relativistic effect whereby the light quanta (photons) that are emitted from the surface lose about 20% of their energy as they escape from the neutron star. Their wavelength is consequently red-shifted by that amount. The spectral observations were difficult, first of all because of the extreme faintness of RX J1856.5-3754 . But even though an excellent spectrum was obtained with the multi-mode FORS1 instrument at VLT ANTU, it was indeed quite featureless and no spectral features were seen. Nevertheless, as it often happens in astronomy, these observations did bring surprises. The first was that the neutron star had obviously moved on the sky since the HST had observed it in 1997. From positional measurements and the assumed distance, approx. 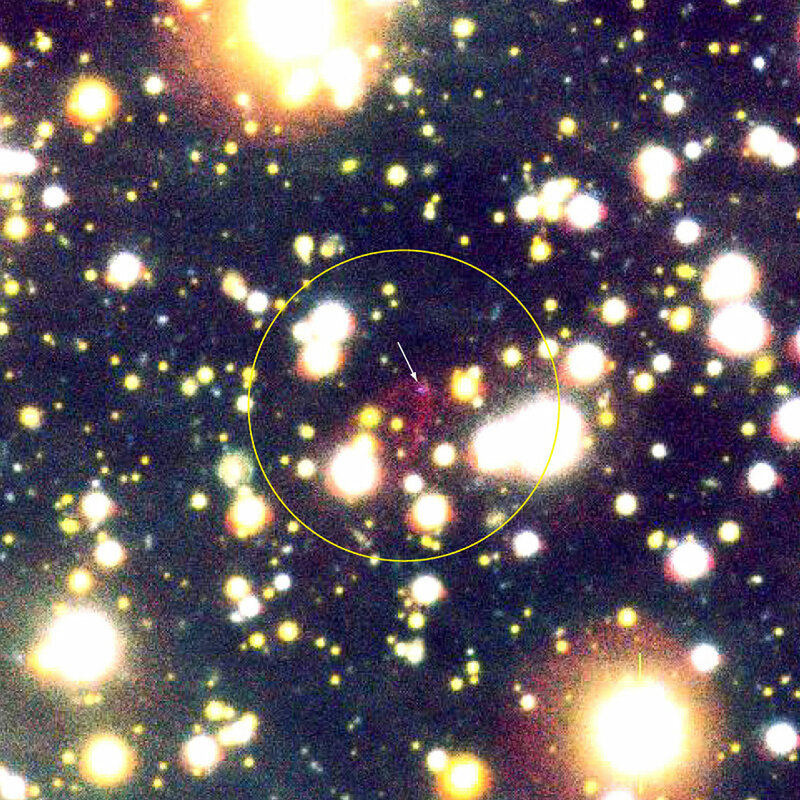 200 light-years, RX J1856.5-3754 was found to be moving with a velocity of about 100 km/s . However, at such a high speed, it is hard to imagine how it would be able to catch much interstellar matter, whose infall might heat the surface as described above. The puzzle was deepening! Another surprise was that the spectra showed very faint emission from the neighbourhood of the neutron star. The measured wavelengths identified these emission lines as H-alpha and H-beta, two of the so-called Balmer lines that originate in hydrogen atoms. Most likely, the strong radiation from the very hot surface of the neutron star is ionizing hydrogen atoms (separating them in a proton and an electron) in the surroundings, a process that also takes place near very hot, normal stars. The observed emission is then produced when, at a later time, the protons and electrons again (re)combine into hydrogen atoms. Interestingly, a simple estimate of the hydrogen density near the neutron star that is needed to produce the observed glow indicates the presence of about one hundred hydrogen atoms per cubic centimetre. This is no less than one hundred times the usual density in the interstellar medium. So maybe the surface of RX J1856.5-3754 could still be heated by infalling hydrogen atoms? With the inferred hydrogen density near the neutron star, about one thousand years on the average will elapse between the moment of ionization by the passing neutron star and the subsequent re-unification of a proton with an electron to form a hydrogen atom. During this time, however, the fast-moving neutron star will have covered a substantial distance. For this reason, it is expected that much of the hydrogen emission will not be seen very close to the neutron star, but rather along its "recent" trajectory in space. In order to test these ideas, additional observing time was granted on the VLT to obtain very "deep", direct images that would attempt to map the hydrogen glow. They were carried out by ESO staff astronomers at Paranal in "service mode". Exposures lasting more than five hours in total were taken through a narrow optical filter that isolates the H-alpha hydrogen emission. In addition, shorter exposures were taken through B(lue) and R(ed) filters. The exposures have been combined into the false-colour ESO Press Photos eso0029-b. 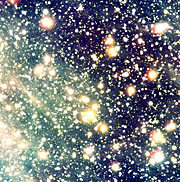 Legions of stars are seen in the photos. This is partly because of the extraordinary light sensitivity of the VLT, and partly because a star-forming region is located in this direction. Stars like our Sun appear whitish, relatively cool stars emit little blue light and appear more reddish, while hot stars appear blue. The photos clearly show a lot of diffuse light, especially in the lower left area. 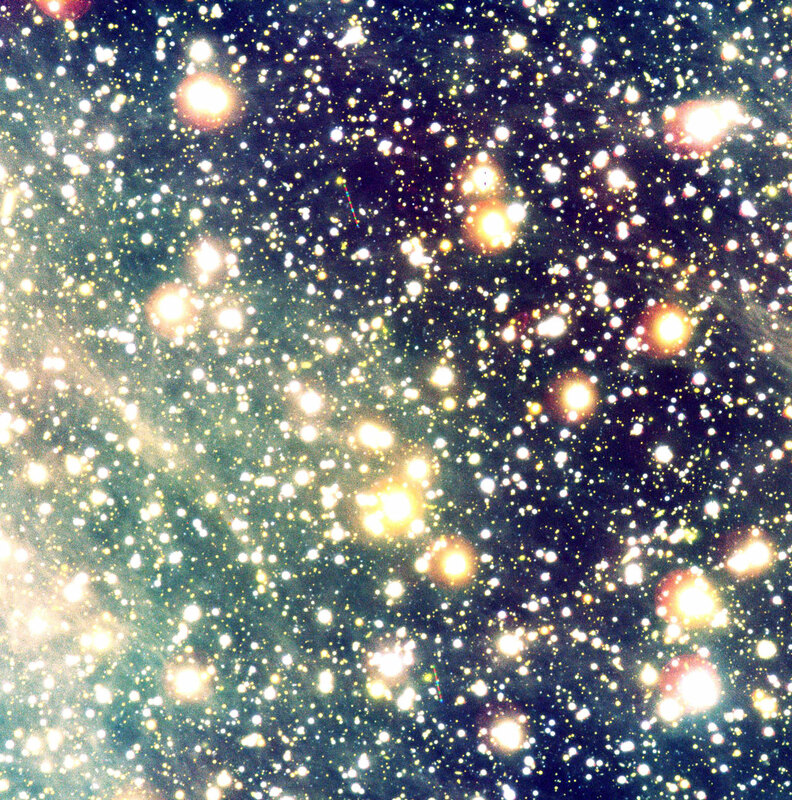 This is most likely starlight reflected off interstellar dust grains. A small area, just a little above and to the right of the centre of ESO Press Photo eso0029, has been enlarged in ESO Press Photo eso0029 . It shows a small, cone-shaped nebula never seen before - this is the emission from hydrogen atoms near the neutron star RX J1856.5-3754. The star itself is the very faint, blue object very close to the top of the cone. The shape of the cone is like that of a "bowshock" from a ship, plowing through water. Similarly shaped cones have been found around fast-moving radio pulsars and massive stars. However, for those objects, the bowshock forms because of a strong outflow of particles from the star or the pulsar (a "stellar wind"), that collides with the interstellar matter. Because of this analogy, one may think that a "wind" also blows from RX J1856.5-3754 . However, for this a new hypothesis would have to be invoked. An alternative, perhaps more plausible possibility is that when the surrounding hydrogen atoms are ionized, the resulting electrons and protons acquire substantial velocities, heating the interstellar gas near the passing neutron star. The heated gas expands and pushes aside the surrounding cooler gas. In the end, this process may lead to a geometrical shape similar to that caused by a stellar wind. At present, it is still uncertain whether the observed density of the surrounding interstellar matter is sufficient to heat RX J1856.5-3754 to the observed temperature. Images of the Crab Nebula and its pulsar from VLT KUEYEN and FORS2 are available in ESO PR 17/99. In fact, a neutron star is like one big atom with a diameter of 10-20 kilometres, and weighing about as much as the Sun. The mean density is an unimaginable 10 15 g/cm 3. Thus, a pinhead of neutron star material (1 millimetre across) weighs almost 1 million tons, or about as much as the largest oil carrier ever built, fully loaded. The apparent visual magnitude of RX J1856.5-3754 is 25.6, or nearly 100 million times fainter than what can be perceived with the unaided eye in a dark sky. The motion of RX J1856.5-3754 was also found by Frederick M. Walter (Stony Brook, New York, USA), who also determined the distance, cf. the corresponding research article that is now available on the web.